John Siracusa: Though I've spent my career as a web developer, I'm better known on the Internet for my articles at Ars Technica, especially my very long and detailed reviews of OS X going back 13 years, and for my podcast, Hypercritical, which just ended its two-year run. I'm also a regular guest on The Incomparable, a podcast about geeky books, movies, TV shows, comics, and video games. FV: In your Hypercritical article posted on Ars Technica in May 2009, you mentioned your artistic background and how, in a way, it contributed to the development of your critical thinking process. And what about me? What have I parlayed my critical nature into? Well, for one thing, it let me turn some basic manual dexterity into a childhood filled with artistic creation. In my adult life, I suppose it wouldn't be an exaggeration to describe my best-known body of work as several hundred thousand words about exactly what is wrong (and, to be fair, also what's right) with Mac OS X. Though it may sound depressing to compulsively find fault in everything, I've found that the benefits definitely outweigh the drawbacks. However, programming and writing prose (albeit on technical subjects such as Mac OS X) are two distinct endeavors that require different mindsets, skills, and thinking processes. Like art lessons when you were a kid, have you found programming -- your day job -- to have a deep influence on you as a writer? Would you liken some parts of web development ("it works") to the goal of your writing ("it conveys my message")? JS: Only insofar as it's made me wish that English was as regular and well-formed as most programming languages. When you spend all day writing for a compiler, it's sometimes frustrating to have to switch over to writing for humans, which have far more inscrutable rules and terrible error messages. My programming is probably more influenced by my writing, actually. After a certain number of years, programming becomes much less about correctly instructing the computer and much more about clearly expressing your intent to the humans that will read the code later—including yourself in six months. That's partly why I love the Perl programming language, which is heavily influenced by the study of spoken and written languages. FV: Is this (at least partly) the reason why Hypercritical started with a "follow-up" session? Is it possible to convey a message, as intended by the author, exactly right to an audience without comprimising its nature due to the unpredictability of some areas of the English language? JS: It all comes from a desire to be understood. The Internet magnifies this problem. Many things we say and write every day to individuals and small groups are misunderstood. But say those same things to thousands or millions of people on the Internet and some portion of the much larger number of people who misunderstood you will actually reply in a way that makes this clear. Then the dance begins. Why wasn't I understood? How can I make myself clearer? What assumptions need to be stated? What is the context of my statement? And on and on. FV: In this regard, have you ever found substantial quality counterarguments/suggestions in the comments to your articles on Ars? JS: Yes, definitely. Ars Technica has some very smart, informed readers. There are the expected tech-partisans and troublemakers in the comments area, but also some gems. And even when I'm not persuaded by an argument, reading a well-articulated opposing opinion can really help me refine my point of view. FV: Whereas I would guess the kind of feedback that you get is very different for podcasts? What is your relationship with the Hypercritical audience? JS: The Hypercritical podcast evolved into something closer to a conversation with the audience. It was more casual and participatory. I was much more likely to delve into areas where I'm not an expert, then learn from the feedback and revisit the topic on the next show. When writing an article for Ars, I usually stick to things that I already know a lot about and have researched as extensively as time allows. FV: So tell me about the history of the Hypercritical podcast. How did it come to be? JS: I am terrible at remembering the details of events in my own life, especially if they involve dates, so forgive me if I speak in generalities here. The first podcast I can recall listening to with any regularity was Geek Fu Action Grip by Mur Lafferty. It was just her and a microphone, but I found it riveting. This planted a seed in my mind. Podcasting was a thing you could do with just yourself and something to say. Well, I had both of those things. I'd been expressing myself in writing for years, so why not audio too? Several years later, a Twitter conversation involving Jason Snell and some friends led to the idea of a podcast about geeky topics featuring a rotating ensemble cast. Jason made it happen and called it The Incomparable. I was part of the ensemble and have been doing the show ever since. Even before The Incomparable started, Dan Benjamin had been talking to me about doing my own podcast on his then-new network, 5by5. Podcasting was Dan's full-time job, but I had a different full-time job. Our availabilities didn't overlap at all. But Dan was persistent. Eventually, we found a way to make it work and I took the plunge. The schedule shifted around quite a bit to accommodate our changing situations and time zones, but we managed to do a weekly show for two years, only missing a few episodes for family vacations and such. FV: Obviously a huge amount of research went into Hypercritical to make each episode unique, well-researched, and yet cohesive with the rest of the podcast. Were you keeping notes for each episode, aside from the show notes available on the 5by5 website? Can you describe your "research workflow" for Hypercritical? JS: I had one master "Notes" file, formatted using the primitive outlining mode available in TextEdit. (Type option-tab in a TextEdit document to try it.) It was split up into two main sections: one for follow up and one for main topics. I added information all week from listener feedback and my own research. I put a "Hypercritical" label on all my email related to the show. I'd also email myself links to show-related tweets and give them the same label. Especially promising emails got a star. The night before the show, I went through all my Hypercritical-labelled email, starting from the date the last show recorded, paying special attention to the starred items, and built the final version of my notes. Right before each show, I duplicated the entire Notes file and renamed the copy "Episode NN" where NN was the number of the upcoming episode. Then I deleted everything from the episode file that I wasn't going to talk about this week and added all the relevant links to the show notes on the 5by5 web site in the order that I planned to talk about them. Finally, when the show was over, I added the show title to the episode file's name, double-checked the show notes links on the web site, and deleted everything from the main notes file that I ended up talking about on the episode that was just recorded. So in the end, it was just a bunch of text files plus a routine, really. FV: Do you still not use Apple Mail? Perhaps you've switched to Outlook 2011 now? JS: I use Gmail's web interface most of the time. I use Outlook 2011 at work for its Exchange integration, and I use it at home to create a local backup of all my email. FV: Aside from the Hypercritical podcast, I'm curious to know if and how you archive reference material for your research. Do you use a bookmarking system for URLs, or something more complex if you want to save, for instance, quotes, bits of text, or images? JS: For my OS X articles, I used to use Yojimbo exclusively, but I've recently been using Dropbox plus a TextEdit document in outline mode. I use Simplenote on iOS when I'm taking notes at WWDC. For everything else, I use Instapaper for links and Dropbox for files. FV: I'd like to move to the Mac OS X subject with a quote from your "Five years of Mac OS X" article published in 2006 on Ars Technica. In my lifetime, I doubt I will ever experience a technological event that is both as transformative and as abrupt as the introduction of the Macintosh. This was written before the introduction of the iPhone, iPad, iOS, and iCloud. Does it still hold true for you? JS: In the context of operating systems, yes, definitely. The difference between a command-line interface and the Macintosh is much greater and more significant than the difference between the OS X and iOS. The Mac was not a better, fancier DOS or Unix shell with a new user input device. It was something entirely different. The biggest leaps are almost always early in the development of a technology. For example, consider the change from superstition and folk remedies to the germ theory of disease. Even with all the medical advances since, what can compare to that leap? This is not to undersell the mobile/touch revolution or the discovery of DNA or what have you. But I see each of those as an accumulation of incremental changes after a much more significant discontinuity. Whatever the next comparable leap ends up being (Neural implants? AI? Quantum computers? ), I assume I'll be dead by then. FV: But let's assume, for the sake of this interview, that there's a younger Siracusa out there. Do you believe he'd point at another technological breakthrough like iOS and multi-touch, specific devices like the iPhone, or something broader like modern social networking tools? Do you think anyone would choose "the first time I used OS X"? FV: Do you think that being a Mac user of over 20 years has made you a little cynical? Do you find yourself more skeptical in believing something can be "really great" (in regards to Mac OS X)? JS: No, definitely not. I'm still completely ready to be bowled over by something great. I think both the iPhone and the iPad met that mark easily. They both changed my daily life usage more than any tech product since TiVo. FV: Some people tend to associate you with a "nothing is so perfect" philosophy. I want to go the opposite way for a moment. Tell me about some OS X changes or new features that have been underestimated by general consensus -- "some things aren't so terrible", if you will. JS: I think Time Machine has been underestimated. Before 10.5, I never met a non-geek Mac user who did regular backups. Nowadays, many of the non-geek Mac users I meet are using Time Machine. It's pretty amazing since these people almost always had to also spend extra money to buy a (usually crappy, USB) external hard drive. But they're doing it! I still think there's a long way to go to make people's data safe, but Time Machine was a big step in the right direction. FV: Would you say the same about iCloud backup? Did it generalize the concept of iOS backups enough? JS: Not nearly enough, if only because it costs money to store more than 5GB of data. In my experience, people are much more willing to buy a $200 external hard drive than to sign up and pay even just $20 a year for some extra storage. It makes little sense, but that's human nature for you. FV: Do you think Apple has done enough to explain iCloud features such as backup and sync (of contacts, calendars, etc) to customers? Particularly in the initial guided setup of iOS 5/6 and Mountain Lion -- where iCloud is front and center -- is there anything you'd improve to better introduce users to iCloud? JS: I don't think it's the explanation that's lacking. The prompts and defaults are fine. Reliability, performance, and transparency iCloud's biggest problems. The free storage limit is a secondary issue. It's lying there in wait, just in case you actually manage to get through iMessage, email, calendar, and document syncing unscathed. FV: Document syncing is indeed another subject I wanted to touch upon. You've written (and talked) about how you use Dropbox to manage files, but you obviously covered the new iCloud document storage in your Mountain Lion review. You mentioned how "segregating" document storage by application won't likely surprise users accustomed to the iOS model. More than a year after the launch of iCloud on iOS, do you believe a unification of document storage is something Apple should consider for iOS 7? Where would you draw the line between consistency and frustration caused by having documents separated by app, only "connected" by an "Open In" menu? JS: I'm not sure the problem can be solved by simply improving communication between silos, but if Apple doesn't do something, Dropbox will continue to eat its document-syncing lunch. It would be nice if the model Apple came up with for iCloud document management solved most people's problems, but it doesn't. Dropbox is obviously tailored to people who already understand files and folders. It's tempting to view it as a "nerd solution," with Apple on the side of the novice users. Philosophically, I think that's true. But practically speaking, even expert users often find themselves stumped by iCloud document sharing across iOS and OS X. Unfortunately for Apple, Share Happens™ for experts and novices alike. And when it does, iCloud is nobody's friend. FV: But surely there needs to be a "next step"? Now that both iOS and OS X apps share the same iCloud document library, the odd one left is the standard Open/Save dialog of the Mac. Realistically, does it make much sense to adapt this to iOS, perhaps translating it into a "app browser" for documents contained in other silos? Or is the other way around more likely -- giving further importance to the iCloud aspect of the OS X dialog, making the "normal" Open/Save more buried and "power-user only"? JS: I don't think any of those things are great solutions. The only clarity we have in this realm is that Dropbox is a good implementation of a shared traditional file and folder structure. I guess we also know that traditional files and folders are a non starter for a huge portion of the market. We've proven that over and over since the dawning of the PC era. We're all looking for something better. iCloud as it currently exists isn't it. Maybe iCloud plus some tweaks will be? I have my doubts, especially given Apple's track record in this area. FV: For document sharing, how would you see something like Windows 8's Contracts or Android's Intents as a bridge between app silos on iOS? JS: iOS definitely needs a better way to handle inter-application communication, but documents still have to live somewhere. If one app can't read from another app's iCloud document silo, I'm still stuck jumping elsewhere and "sending" the document to the app I actually want to use. FV: Do you use iOS much for document management? JS: Not much, but what I do is mostly centered around Dropbox and apps that use the Dropbox API. The documents are mostly text files, and TextEdit has iCloud integration. But iCloud's document handling utterly fails me here. FV: So you don't think of Dropbox as a feature? Maybe one that Apple would love to own? JS: Apple could have made a service just like Dropbox. Now, years later, with a ton of popular iOS apps integrating the Dropbox API, it'd be a bit harder for Apple to unseat. But technically speaking, there's nothing Dropbox does that Apple couldn't do. But Dropbox is not what Apple wanted to build. Apple wanted something that avoids the worst problems of files and folders while still doing the same job. iCloud falls short of that mark, but I don't think the solution is to give up and just reimplement (or buy) Dropbox. FV: Why do you think Apple couldn't get document storage in iCloud right? Bad management, time constraints, or something else? JS: I think they created a conceptually clean solution that just doesn't cover the entire problem space. If application and documents really were in an unambiguous one-to-one relationship (and if iCloud was always up, fast, and reliable) then iCloud document storage would be great. But the real world is uglier. People don't remember what app they used to create a document. People want to open a document created in one app in another app. Some people even find more than one level of hierarchy useful when organizing documents. FV: Conceptually, iMessage is another technology that could solve a common problem, but that, at least for me, has failed in two areas. One is realiability and performance of the messaging application itself. The other is the lack of awareness of user presence and "active device" state. Should the latter be improved? Can it be improved with current push and geo-based technologies? JS: Yes, it definitely needs much a better system for presence management. iOS devices have all the sensors and services they need to pull this off. But first things first. As you noted, even the basic messaging functionality doesn't work right all the time. iMessage has a long road ahead of it of it. FV: What do you think is the biggest threat to the Mac's relevance? JS: The Mac is in the same boat as the rest of the "PC" market in terms of relevance. Right now, as much as we all love our iPhones and iPads, few of us do our daily work on them exclusively. A Mac or a PC is still somewhere in the picture. When that changes, there's little reason for the Mac to continue to exist. I've heard people insist that the Mac will always need to exist, if only as a way to develop iOS software. People used to to use the Lisa to develop Macintosh software, but that didn't last long. If "PC"-class products ever fall out of use, it will be because the thing that people are using instead is already capable of doing the job the Mac used to do. All of that said, I don't think this will happen in the near future. But in a decade or two, it's conceivable. The other alternative the Mac could continue evolve and remain in existence, even if the only thing it shares with the "Mac" we know today is its name. FV: Do you buy Microsoft's theory that PCs and "slate devices" will combine in single, multi-purpose products? JS: I don't think it's a ridiculous notion, but Microsoft's particular incarnation of this vision isn't exactly setting the world on fire. To which, nine years ago, you replied "the command line". I'd like to ask it again today, taking into account the changes that happened to OS X, and iOS. JS: Same answer. All of the new user experiences introduced since then that appeal to me today have done so from the start. At this point, the only thing keeping the hounds at bay is the reality that a TV with non-crappy software requires a much deeper cooperation with content providers. So while Apple can whip up a TV running iOS in its sleep, giving that software something useful to do requires talking to content owners—and possibly also cable companies and ISPs, who are even more keen to keep the content owners in their camp, and who have barriers to entry that the auto industry would die for. And this is before even considering the fragmentation of TV and Internet access in the US and around the world. Living in Italy, I can't imagine the kind of effort that would go into creating a single "tv" device capable of working with the US system, the Italian system of public and private networks, and so forth. What are your considerations on the fragmentation of TV "in the US and around the world"? JS: Where does the TV programming come from? Over the air, a wire, or a fiber? Who's sending it? The government? A government-sanctioned monopoly? Several national companies? Local companies? What is the format? How are different channels delivered? How is information sent back from the TV to the provider? How does the TV know what provider and plan you have and what channels are available? Those are the kinds of things I was thinking about. You can, of course, simplify a lot of this stuff if your TV gets all its content from the Internet. But in the US anyway, most ISPs also provide TV (and phone) service, and they're not exactly excited about other companies using "their" Internet connection to send TV-style content that competes with their own TV plans. And all those wires and cell towers make for quite a barrier to entry. Then there's the government trying to keep things in some sort of balance. It's a mess. And now repeat in many different permutations for each country. FV: In terms of possible interface and hardware decisions, there seems to be a lot of confusion in the rumors and speculation as well. A Siri-controlled device. Multi-touch remotes. iOS integration. Apps. Internet streaming, but local hard disk. Not to mention the analysts. I don't mean to add fuel to the rumors, but I want to ask you: what would you like? What would a better-than-TiVo and iCloud-enabled Apple television do for you? JS: I'd like something that Apple doesn't want to build: an "omnivorous box" that would take in content from any and all sources and provide me with a clean, unified, Apple-quality interface to watching and time-shifting it: cable, satellite, streaming services, rentals, purchases, etc. Apple doesn't to make this box for many very good reasons. Google is trying to make it and is failing pretty miserably, so far. Nevertheless, if I had a magic wand, that's the product I'd want — at least to tide me over until someone can finally cut the Gordian Knot of TV content delivery and eliminate all the terrible things that I want this omnivorous box to shield me from. FV: Is the Strategy Tax one of those reasons? JS: Yes, but only a small one. Apple's not turning its nose up at the omnivorous box because it wants you to get all your content exclusively through the iTunes Store. If Apple were that burdened by the strategy tax, Netflix wouldn't be on the Apple TV, for example. The biggest reason Apple is avoiding the omnivorous box is that it hates being beholden to other entities. If you try to build a layer on top of cable, satellite, Netflix, Amazon, etc., you're giving leverage to a ton of other big companies, many of which have a lot of good reasons to screw you — or, at the very least, to force you to make your product worse. Just ask TiVo. FV: But it wouldn't be difficult to imagine a scenario where season 1 of New Popular TV Show is exclusive to "Apple television", sort of like Arrested Development and the Netflix deal. Too much long-term speculation? JS: Apple doesn't demand (or need) exclusivity. It just needs to offer the content people want in a way that is the most attractive to customers. As Jobs noted about the iTunes Music Store, Apple is competing with illegal downloads as much as it's competing with other video storefronts. Illegal downloads provide extremely broad — though usually non-exclusive — access to content, but the user experience is not particularly good. FV: The idea of "a television by Apple" sounds even very apt for the general public. Who doesn't have a TV? It's a very marketable concept. What I'm wondering is, sometimes geeks lose perspective of how technology works for "normal people". In your Mountain Lion review, you wrote how "technology must now work for everyone, not just computing enthusiasts". I completely agree with this point, but I wonder if Apple's products -- the OSes and computers/devices -- still betray some of their "nerd" roots. Are there some areas where you think Apple could be a better "for everyone" company? JS: Is there an area where Apple couldn't be better "for everyone?" iOS was a giant step forward, but there are still miles to go. iOS also makes OS X look even more anachronistic. I'm much more comfortable throwing a random person in front of an iPad than a Mac. FV: But still, that random person could find experience roadblocks on the iPad too. I guess it comes down again to inter-app communication, shared documents, iCloud…? FV: I'd like to change the subject entirely and talk about Zelda now. I know you're a gamer, a Nintendo fan and PS3 owner, and that you have played modern, 3D Zelda console games, and some of the 2D ones for portables. You even use Zelda icons in your OS X review screenshots. I remember when Wind Waker for the GameCube was first announced, the press went crazy about the cel-shading (remember when that was a trend every game developer had to use? ), kid Link (ahem, Space World 2000), and the sea setting. Wind Waker turned out to be, in my opinion, one of the finest Zelda games for home consoles (I was a kid when I played A Link To The Past, but had to skip the N64 so I missed the initial "wow effect" of Ocarina of Time). Then Skyward Sword comes out, and it's widely regarded as a console Zelda game that's only formulaic for the first 20-30 hours, but that changes several Zelda mechanics in the latter part of the game. Having finished both games, and in spite of (obvious) differences between the two (GC vs Wii, Aounuma vs Fujibayashi as directors), which one do you prefer, and why? JS: I prefer Wind Waker. First, Wind Waker's visual style is more successful. Skyward Sword's painterly look is technically interesting, but it feels timid, caught between the extremes of Wind Waker and Twilight Princess. Second, Skyward Sword feels like it's made up of and handful of large rooms connected by loading screens. That's what a lot of video games actually are, under the covers, but the trick is to make it feel like a single, cohesive world. Skyward Sword fails badly there. Contrast this with Wind Waker, where the ability to actually sail from anywhere to anywhere makes the world feel much more like a single place. There are plenty of complaints about the sea in Wind Waker, but the sky area in Skyward Sword makes for an even more barren and uninteresting Overworld. I spent a lot more time idly (and happily) exploring Wind Waker's sea than I spent searching the sky in Skyward Sword. Third, Skyward Sword leans too hard on repeated visits to the same areas and battles. In isolation, each visit is fine. But by the third time I'm running around Lanayru Desert, the place has lost a lot of its charm. (You thought I was going to complain about The Imprisoned, didn't you?) Despite some great dungeons, Skyward Sword just feels like it has too few areas, not enough new things to see. Wind Waker is far from a perfect game. It suffers from a few of the same problems as Skyward Sword (hello Triforce shards). But it has such potent character and the world is so well realized that it's not really a contest. Wind Waker over Skyward Sword any day. 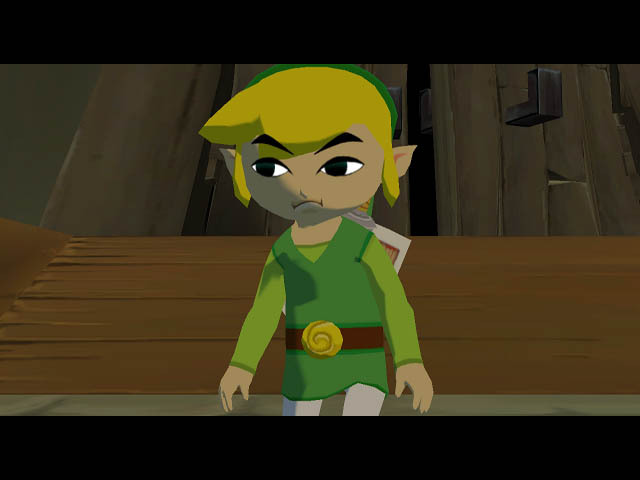 FV: Wind Waker's graphic style was functional to the gameplay and nature of the game itself. For instance, giving Link big eyes allowed Nintendo to develop a range of facial expressions that would give clues about, for instance, an item to use in a puzzle -- because Link was looking at it. This leads me to two separate questions I want to ask you. First, having played WW with your son, do you think Miyamoto and team succeeded in making a game for a wider audience? We actually think that as you play this game and look at the world around you, it's going to seem very realistic despite the graphics style. By using the term "realistic," I mean the qualities of the world itself. I don't mean to deny the value of the more photorealistic graphics, but the more realistic graphics get the more unrealistic things such as bumping into a wall or getting hurt might be. If not expressed properly, it will seem out of place. This time we've tried to have very realistic expression. We want to have a game where everything in the world feels like it is in its place. We think that when you play, you will see Link do something and not react in a way that's not realistic. From the point of view, The Wind Waker is very realistic in terms of expression and the whole oneness of the world. On one hand, a realistic experience made possible by the (back then) powerful hardware of the GameCube. On the other, Nintendo's insistence to focus on less powerful hardware with the Wii. As you wrote in 2006, "power" in console hardware is beneficial to a game's experience as well -- for example, with advanced physics engines. Do you think "power" and Nintendo are too different entities to ever meet again somewhere in the middle? After Wind Waker, Twilight Princess, and Skyward Sword, where would you like Nintendo's "realism" to go for the next Zelda game? JS: I think making the game easier than Ocarina (and shorter than Twilight Princess) helped increase the number of people willing and able to finish the game. I don't think the art style was much of a factor, except perhaps to get a few more parents of young children to buy the game unprompted. That aside, I'd like Nintendo to focus the newfound hardware power of the Wii U on making a more coherent, expansive world for Link, regardless of the art style. I want fewer loading screens and repeating areas, more sophisticated enemies, and more beautiful vistas that are less encumbered by draw distances. I also hope the new Zelda game has an amazing lighting engine. I still remember the first time I played Ico on the PS2. That system had a fraction of the Wii U's power, but the mood and sense of place created by the lighting still sticks with me. FV: Do you think Zelda games for the Game Boy Color, GBA, and DS have served as some sort of "idea playground" for Nintendo? Perhaps not strictly speaking -- there's no alternative to the Minish cap on console Zeldas, as far as I know -- but in the sense of development exercise? Or maybe original "plot fillers" for the whole Hyrule history? JS: I think the technical limitations of Nintendo's handheld platforms have led to more creative variations on the same kind of game. There were 2D Zeldas on Nintendo handhelds long after the console Zeldas had gone 3D. How many times can you do the same 2D Zelda game? Nintendo had to get creative, and it did. The other factor is that the console versions are still seen as the standard-bearers for the franchise, while the handheld games are more like "b-sides." That takes the pressure off and lets Nintendo do, say, a train-based Zelda or something equally off-beat. FV: Do you believe Nintendo has been equally creative with the 3DS so far? Still too soon to judge? JS: I think so, sometimes even going a bit too far, as in Kid Icarus Uprising which shipped with a stand to allow the game to be played without hand-destroying contortions. Nintendo's still pushing the limits. FV: Something that I've wondering a lot lately is: how do new generations -- kids raised with multi-touch as a standard -- see Nintendo? Here's my problem. I'm a Nintendo fan. I've owned almost every console put out by Nintendo starting with the SNES. Growing up, between work and "life", I had less and less time to play, but because I'm a Nintendo fan at heart, whenever I have 2 hours free I try to play the Zeldas and Metroids and Marios that I love. However, I have questions. On one hand, I know other Nintendo gamers aren't like me. Perhaps they've grown tired of Nintendo over the years, and they are now enjoying their PS3 and Xbox (especially after the lack of blockbuster Wii titles, with the exception of Zelda I'd say, in the past 2 years). On the other, I wonder if "new gamers" see the appeal of Nintendo as much as kids did in late 80's or as I did in 1994. Back then, Nintendo was more or less the synonymous of console gaming. Today a parent can repurpose his or her iPhone without a SIM and let kids play "acceptable" games (some "very good") at one tenth of the price of a 3DS or Wii game. Horace Dediu argues that games on iOS devices are good enough. Miyamoto says they think about the things "you can't do on a smartphone", but he also expresses the increasing difficulty of "accommodating both groups" of experienced players and players with no experience. Nintendo is still pushing the limits, but do new generations see it? Second, in my own experience with my 8-year-old son, Nintendo games still have an unmatched ability to capture the hearts and minds of kids. My son has been exposed to a ton of iOS games, on the iPod and iPad, plus PS2, PS3, and even PC/Mac games. But he chooses to spend the vast majority of his gaming time on a Nintendo console, playing both "causal" games (Wii Sports, Nintendoland) and long, deep games (Zelda, Mario). This is not to minimize Nintendo's woes. The threat from iOS gaming is very real. But it is heartening to know that the things we love about Nintendo are not entirely based on nostalgia. FV: Do you think Nintendo has perhaps "ignored" iOS gaming for too long? The eShop still feels like a very timid attempt at a digital marketplace (especially when Nintendo itself isn't setting an example for digital first-party releases) . JS: Nintendo's "expertise lies elsewhere", as the euphemism goes. Hiroshi Yamauchi was a stubborn son of a gun, but that spirit of obstinacy was mostly broken by Iwata and the Blue Ocean strategy. I just think Nintendo doesn't know how to make a good online service or marketplace, despite having both Xbox Live and the App Store to crib from. Great games will probably keep Nintendo viable for a while longer, but at some point it'll have to get good at some new things to stay relevant. FV: Is building a decent online platform a matter of "throwing money at the problem" for Nintendo, or an issue of people skilled in such area going to work for someone else? For instance, Apple wasn't (still isn't?) regarded as the best company to work for if you want to build online services. JS: "Throwing money at the problem" is pretty much never the solution to anything involving software. It's a matter of mindset, focus, and even identity. Nintendo does not identify as an online service, social network, or digital marketplace (as much as any corporation can "identify as" something). The consequences all flow from that: can't hire the people you need, those efforts don't get the resources or attention they need, etc. FV: Does Nintendo identify with Miyamoto though? Not for "regular people" (will today's kids want to know who Miyamoto is? ), but for the company itself. Do you believe there are signs that point to Nintendo being too dependent on Miyamoto's figure? JS: I think Nintendo has done a good job of slowly dispersing Miyamoto's talent, ethos, and responsibilities throughout the company. For example, after Wind Waker and Twilight Princess, I'm pretty confident that Eiji Aonuma can handle the Zelda franchise without Miyamoto's help. That transition took many years, but Nintendo did it. From the outside it definitely seemed like a conscious effort to make Miyamoto less of a lynchpin. FV: For a company that so tightly integrates its own hardware and software, Nintendo devices seem strangely disconnected from each other. There were some experiments in the GameCube era with the GBA (or: Game Link cable), but the Wii and DS didn't have any notable examples of first-party games with connectivity options. With the Wii U and 3DS, Miyamoto has said this is something they may consider again, but that they "put on the shelf" because they realized people who own a Wii don't necessarily have a DS (and vice versa), and making games that solely relied on that functionality wasn't worth it. Is console-portable device connectivity something Nintendo should explore again, particularly for local multiplayer? JS: Nintendo would benefit from a true company-wide platform. For Apple, iOS is the platform, and it runs on the iPhone, iPad, and Apple TV. That doesn't mean the same games are available in all those places (or at all, in the case of Apple TV), but it does mean that it's a lot more feasible to bridge and/or bind the three separate screen sizes and contexts. Assuming Nintendo ever does get itself a true multi-device platform, it'd still have to face the problem that Miyamoto cited: games that require expensive, optional hardware devices are limited by the number of customers that have or are willing to buy both. The Wii U was a clever end-run around this limitation. All Wii U owners have a second screen on the bundled GamePad. FV: Besides the current "hide and seek", map/inventory, and screen-mirroring implementations, have you thought of other ways the Wii U GamePad could improve gaming experiences (either single or multi-player)? JS: Using the GamePad as a "magic window" to look around in a 3D world has some surprising benefits. I find first-person aiming a lot easier to fine-tune in that view than when controlling the aiming reticle with a thumbstick alone. Maybe some of the auto-aim in console FPS games can be toned down. FV: The GameCube was seen by many as a "conservative" choice for Nintendo. Then Nintendo came out with the DS, the Wii, and expanded the market to new areas. Asked about emerging technologies, Miyamoto said that it's important "to look around and aggressively understand and consume" them; this reminded me of Steve Jobs saying that Apple tries to "pick things that are in their springs". Are there technologies that Nintendo failed to see as emerging and relevant? JS: Online social interaction and multiplayer comes to mind. And optical discs, if you want to go back a bit further. Nowadays, it's probably the trend towards a more open marketplace for games with much lower barriers to entry for developers. How many creators of top-quality blockbuster indie iOS games would have ever even considered trying to make a game for a Nintendo console? FV: But that's more an issue of different approaches to distribution, right? Anyone can sign up for $99 to Apple's iOS dev program and release an unlimited number of apps/games. For the Wii U you have to request a dev kit unit, and even if you want to publish a game on the eShop -- which isn't exactly fine-tuned for game discovery -- the process doesn't sound streamlined at all. Nintendo may say they want to "get smaller studios involved", but clearly that kind of stuff is happening on the App Store and, I guess, on Steam (especially with Greenlight)? JS: Right, and that's what I'm saying Nintendo missed: that the much more permissive iOS model can lead to an explosion of creative, interesting, high-quality games (in addition to the flood of crap games that Nintendo did expect). FV: Do you think the addition of all these layers atop a standard console experience (motion controllers, dual-screens, research into…room projectors?) may be related to the fact that, after 30 years and with sufficiently advanced 3D graphics, it's becoming more difficult to surprise gamers? JS: I don't think it's about surprise. Technology is opening doors to types of gameplay that were previously impossible. Waving a Wiimote around while playing tennis is a great example. There have been tennis games for decades, but the one in Wii Sports was a giant leap closer to the actual experience of playing tennis that all those old games were trying to convey. FV: What are gameplay experiences that impressed you in recent years? Experiences that made you realize they were only possible thanks to new technologies? JS: Asynchronous multiplayer on a ubiquitous handheld device (e.g., an iPhone) has really changed my gaming life. All of the individual technologies to make this work existed long ago, but they didn't all come together until recently. Call it "gaming for busy people." Most recently, supporting ground troops by flying Samus's gunship in Metroid Blast (in Nintendo Land) was a great new experience. Excellent voice chat with no headsets (everyone's in the same room), novel aiming mechanics, dual-stick flying, and no split screen for anyone when there are only two players. FV: Asynchronous multiplayer with turn-based APIs is one of the aspects that made Letterpress so easy to pick up (though I'd ask Brichter if he struggled to implement those APIs). What's your take on the current state of Game Center as a gamer? Practically speaking, Game Center has not been very reliable, and the feedback in most games that use it is nonexistent. I end up just staring at a game's screen, hoping that the move that I just got an iOS notification message about will eventually appear in the game itself. The mechanism for managing friend lists and inviting people to play a game is confusing and much too heavyweight. No one seems to know their Game Center username, and many don't even realize that it's not the same as their email or Apple ID. The links in the email requests sent form Game Center only seem to work for me when I tap them in the official Apple Mail app on iOS. This is especially frustrating when sending requests to non-tech-savvy people who use Gmail. Having a mandatory message filled with boilerplate text ("Want to play Letterpress — word game?") with each game request is annoying. I'm not sure how many of these to blame on Game Center itself, or if some are just idiosyncrasies of Letterpress (which remains the only Game Center game I play regularly), but I'm pretty sure Loren Brichter wouldn't have made a lot of these choices. FV: How would you improve Game Center? JS: Make it more responsive and reliable. (Same answer for most of Apple's online services.) Make the user interface much more neutral, visually, and possibly also slightly customizable when it appears in the context of a game. Make inviting and adding friends require fewer steps, and make it work everywhere possible, not just when the entire communications chain involves only Apple apps. Provide more/better APIs for exposing progress during long-running service requests. Add a web interface. FV: Isn't it a bit curious how Apple positions the iPod touch as the best mobile gaming device, yet they're not offering a 3G-enabled touch to always be connected to Game Center? JS: MacBooks still don't have 3G either. I'm not sure what the holdup is. You could say that 3G would add expense, size, weight, and complexity to the touch, but since it's in the iPad, what's the excuse for it not being in a MacBook? Maybe this will be the year. FV: There's a lot of talk about Forstall leaving Apple and Ive now leading the Human Interface group in the company. Somehow, some people think Ive can magically fix Apple's software woes with a new interface design. I agree with the argument that Apple has deeper issues to solve. I'd like to know, John, examples of "bad software" you believe Apple has released in the past years, and why do you think Apple ended up making bad software. JS: The Podcasts app was buggy when it was released, and it was meant to replace something that, while not fancy, more or less worked the way it was supposed to, and was part of many people's daily routines. The latest version of iPhoto is worse than its predecessor in almost all ways. Features were removed or hidden for no practical gain and much pain. I actually find the performance worse than the previous version as well, though others tell me the new iPhoto is faster for them. iTunes 11 introduces some interesting new interface features, but it doesn't fix the worst of the problems that have afflicted iTunes for years. It was also quite buggy at launch. It even had bugs that caused elements of the UI to draw on top of each other. That kind of embarrassing, screenshot-able bug rarely slips out of Apple. As for why, I think the reasons are probably different for every one of my examples. From the outside, I can only speculate. But one thing I have heard is that the teams working on some apps at Apple are often much smaller than people on the outside would guess. Small teams can do great things, but they can also be overwhelmed by the task set before them. Shifting priorities within the company are also a factor. Every project can't be the most important project in the company, with all of the best people working on it. As with all software,, technical debt is an issue. The distance between iTunes 11 and a clean, fast, shiny, feature-rich, bug-free, pure-Cocoa version of iTunes is quite large, and it's not clear how best to bridge the gap (and don't forget about the Windows version…and Windows 8). FV: Aside from bugs, do you think some of Apple's software problems are related to rarely saying "Yes" to feature requests/suggestions from its users? JS: No, I think it's a result of Apple's admirable drive towards simplicity going a bit awry. Simplicity is great, as iOS has shown. But there's a difference between conceptual simplicity and visual simplicity. Just hiding controls does make things appear simpler, but it doesn't actually make them any simpler. The complexity is now just hidden. Similarly, removing features that few people use is a good idea, but like any good idea, it can be taken too far. At a certain point, you're just making your application worse for everyone, even new users. You can't always tweak or refactor an existing application into the beautiful thing you're envisioning. Sometimes the only way to achieve true simplicity is to start over with a new concept for the whole app. I think Jobs was pretty good at reversing course when needed, while also giving each effort a fair shot. Cook seems to have a similar temperament. He didn't clean house the day he took over. He gave the existing executive team a chance to gel under him. But when that didn't happen over the course of several major releases, he took decisive action. I think Cook is mostly striking the right balance, but there are a few black marks. Browett was a bad hire, full stop. Letting whatever was perturbing Mansfield fester for as long as it did was obviously a mistake that Cook had to scramble to fix. He did fix it, but avoiding it would have been better. FV: What are examples of Apple software that you believe should be redone completely at this point? JS: iTunes, for sure. Though I'm happy with the kind of application iPhoto was in the previous version, Apple seems to want it to be something different and has created an unsatisfying mongrel in an effort to get there. I'm loathe to suggest that the Finder should be overhauled because I suspect I'd find the result even more objectionable, but the current version doesn't seem to make anyone really happy. I know Messages is brand new, but I also think it's a confusing mess (even ignoring bugs). It's a great example of the "one-window simplicity" school of design totally missing the mark. Calendar probably doesn't need to be overhauled, but it could learn a thing or two from Fantastical. Contacts should ditch the book costume. Most of the poor, neglected applications in the Utilities folder could use all-new versions (though I understand why they don't get more attention). FV: I remember you saying on Hypercritical that Jony Ive can't just magically fix Apple's software problems with new user interface designs. But clearly major overhauls of core apps would likely lead to new designs. Now that iOS and OS X apps have more or less achieved "parity" (at least in terms of design), isn't it perhaps too risky to redo everything from scratch again? Can Apple pull off such a massive task now that users have become accustomed to "how things work/look"? JS: I don't think iOS and OS X apps are close to achieving design parity. As the famous saying goes, design isn't what an app looks like. Design is how it works. The two things may be related, but they're not the same. The look of an app is important, and there I think Ive can help by bringing his much more subdued sense of style to Apple's apps. But the design problems are much deeper than an ugly texture here or an awkward control there. Contacts isn't bad because fake book apps are ugly. It's bad because using it to do the things you do with contacts is a pain. Some of that pain is caused by slavish devotion to the book metaphor, but some is carried over from the old non-skeuomorphic version. FV: Does Apple need a "leader" whose taste identifies with their products? If Cook doesn't apply his taste to the company but prefers to manage and control, perhaps Ive's new role was dictated by the fact that Apple "needs" this kind of leadership? JS: I do think Apple needs to speak with a single voice when it comes to design. Jobs was designer-in-chief, but he delegated the things he wasn't good at to his top executives. For example, Tim Cook took care of the supply chain stuff that Jobs was not as knowledgable about. Now that Cook is the CEO, he'll also have to delegate the things he's not as good at. Cook does not seem cut out for the the designer-in-chief role, so it makes sense for him to pick someone else to do that job. It looks like he's picked Jony Ive. We'll see how it goes. FV: Is realizing that they can't always be "an island" (that they'll need to cooperate with other companies and services to create a modern experience) a part of Apple's evolution? Siri, with its Wolfram Alpha, Yelp, and more integrations, could perhaps be a sign of this happening more frequently? JS: Apple still believes that it produces better results when it doesn't give other companies too much control over its destiny. I mostly agree with that, but Apple can't do everything. These days, Apple seems to prefer to partner with smaller/weaker companies that are not a threat. Apple has been burned several times in the past when partners turned into competitors. Google and Samsung are the most recent examples. Unfortunately for Apple, Google still does online services better than Apple does. If only those two crazy kids could work things out. That doesn't seem likely at this point, though. Apple's been gobbling up small technology companies for years now. That's one way to "partner" with outside companies while also maintaining complete control. I expect that to continue. Sometimes a company just doesn't want to be bought (e.g., Nuance and Dropbox, if the rumors are to be believed). In that case, Apple is forced to partner (perhaps with less favorable terms) or else match or exceed the quality of the product with its own in-house version. That strategy has been been hit-or-miss. We've already talked about iCloud document storage vs. Dropbox. Also consider Siri vs. Google's voice search. Who's doing better there? Who has more control? FV: I think "better" has many ramifications there. Google Voice Search and Google Now have the necessary hooks on Android to let the user "do stuff" rather than just search the web, like on iOS through the Google Search app. But at the same time, on iOS the app is (or partly gives the illusion of being) faster than Siri. It seems absurd to think Apple would ever give guys like Google access to, say, a Siri API that could somehow result in users searching only through the Google Search app. So I would say each player is doing better on their own platform, but iOS users are now curious about this Google voice search thing? That maybe Apple is afraid of opening Siri too much because companies like Google could take advantage of it in ways that would give Apple less control? JS: Google's voice search should be worse than Siri on iOS. Siri is made by Apple, is built into the OS, can use private APIs forbidden to third-party developers, and can build on new hardware that only Apple knows about until it's released. And indeed, Siri can do many things that Google's voice search can't, particularly when it comes to integration with the OS and the standard, preinstalled iOS apps. FV: Is the lack of deep semantic integration with iOS something that Apple could start improving in Siri by buying other companies with more expertise in the field? Or a scenario of "there's no data like more data" with Apple needing more time to start getting this right? JS: As always, Apple is cautious about how it rolls out new APIs. Inter-application communication in general is an important area for future improvements in iOS. I expect Siri to eventually be part of that process. I don't think Apple needs to acquire any other companies to make this happen. It's already got a lot of historical and modern ideas in this area, from AppleEvents to XPC. As for extracting meaning from text input, Apple could probably use some help there. I suspect Google has more institutional knowledge in that area. FV: Could a deeper use of device sensors be an area worth exploring to bring all this together? Combining data from the "outside world" with semantics to better understand what's going on around a user? JS: Sure, but there's still plenty of ground to cover even when just considering the text in isolation. FV: Is there a Mac app you wish someone made, but no one hasn't yet? JS: Yes! I'd love a system-wide window position snap/grid manager. I know you'll say there are a ton of these already, and there are. But none of the ones I've tried work the way I want. I don't want to (just) size or position windows by chopping the screen up into regions (halves, thirds, arbitrary grids, etc.) What I want is both a grid and adjustable margins. A few classic Mac OS apps had this kind of window snap with margins for things like floating palettes. Some OS X apps do too, only now the margins are much more rare. FV: And do you have an "app wish" for iOS as well? JS: A more-full-featured native Gmail client, I guess. I still find myself having to open the Gmail web client in Safari when I can't do something in the dedicated iOS Gmail app. FV: As an Italian, I read your post about cooking Better Pasta with great interest. I agree with every point of it, but it left me curious about one point -- what are exactly the mistakes most Americans make in terms of ingredients? Using American-made Parmesan instead of Parmiggiano Reggiano? Cheap olive oil? JS: Buying jarred sauce is probably the biggest mistake. All the ingredients to make a dead-simple basic tomato sauce are readily available, but people keep paying more for terrible stuff in jars. Our choices for dried pasta are fine. Supermarkets everywhere have a decent selection. We also have a wide range of olive oils. It's really hard to make recommendations there because of the lack of consistency. Products seems to vary with the quality of the olive crop that year. So one brand may be great one year and only so-so the next. There's also the (supposed) widespread adulteration and false labeling of olive oil in this country. All of that said, at least more Americans are buying something labeled "extra virgin" these days. Baby steps. I'll only buy Parmiggiano Reggiano, but that means I know very well how expensive it is. ($20 per pound is not uncommon). You can't expect everyone to spring for that. But I'd rather go without (or use homemade bread crumbs—cheap!) than eat the terrible American imitations. FV: Tell me one random thing that annoys you and that you haven't mentioned on the Internet yet. JS: The Smart Cover for the iPad mini twists out of alignment with the back of the device when the bottom edge (in portrait orientation) is resting on a squishy surface like a pillow. This causes a triangular sliver of the cover to stick up beyond the top edge of iPad. I'm pretty sure the polyurethane hinge is the culprit. The metal hinge on the regular iPad's Smart Cover doesn't suffer as badly from this problem. FV: Looking back at years of writing on the Internet, what is the article you're most proud of, and why? JS: Maybe it's an illusion, but I like to think I'm getting better at writing as time goes on. So when I look at something I wrote more than a few years in the past, I can't help but cringe a bit. In a few years, I'm sure I'll be cringing at what I wrote in this very interview. That said, if I had to pick one thing, I'd cheat and pick my OS X reviews as a single body of work. I say this even though the early ones were not very good. Not enough time has passed since my Lion and Mountain Lion reviews for me to start disliking the writing too much, so those still feel good. I'm also still happy about what I chose to cover in Snow Leopard, ostensibly a "boring" release. In truth, I look back fondly at almost all the things I've written for Ars Technica. Those older articles often seem like they were written by another person, and that distance helps me appreciate them all a bit more, writing details aside. FV: Looking ahead at 2013, where would you like to see Apple going or focusing on? JS: Apple needs to at least select its next big mountain to climb, even if it won't be scaled for years to come. In 2012, Apple made louder rumbling noises about TV, but didn't commit to anything. In 2013, Apple needs to put up or shut up about TV. Apple also needs to start diversifying the iPhone line (as it did with the iPad mini this year), beyond just keeping old models around for sale. FV: And what's next for you in 2013? JS: I'm sure I'll be on a bunch of podcasts, as usual. I suspect I'll go to WWDC again in the summer (assuming I can get tickets) and I'll write a review of OS X 10.9 before the year is out. Or maybe Apple will surprise me. Always in motion is the future. Check out more MacStories Interviews here.